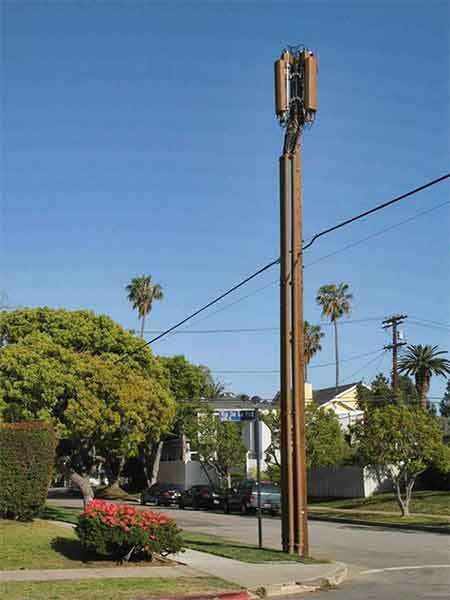 The Pacific Palisades Residents Association is concerned about this “cell phone tower” that was built next to a sidewalk in a public right-of-way in Los Angeles, Calif.
officials this month issued a moratorium on installing them until June so that they can examine the current regulations to determine if changes need to be made. The action came on the heels of Mobilitie requesting to install wireless communication facilities at five locations, including two near residential areas. A city officials called it “pole pollution”. Fresno County, Calif. has also placed a moratorium after receiving requests from Mobilitie to install towers in Clovis and Fresno where it wants to build 120-foot-tall towers along public rights-of-way. The county’s 45-day moratorium could be extended for many months. David Wolfe, Clovis city attorney, said the city could authorize an encroachment permit to allow Mobilitie to construct towers in the city’s public rights-of-way, but “We don’t intend on leasing our rights away for a cell tower. Our concern is that this company isn’t very straightforward.” He said it appears Mobilitie has a “limited right of necessity,” which would require the city’s permission to build towers. Statewide officials in Connecticut have also registered their concerns in past months that Mobilitie has given the appearances of a tower company attempting to rush through approvals without going through regulatory approvals normally required for cell tower construction. The Connecticut Siting Council’s executive director, Melanie Bachman, in media reports, said that after reviewing information sent to municipalities by Mobilitie, she “is concerned about the lack of detail, including information about which mobile providers would use the towers and data proving the need for a tower.” She said Mobilitie might try to circumvent the application process by arguing that wireless service is a public utility that it is already licensed to provide.